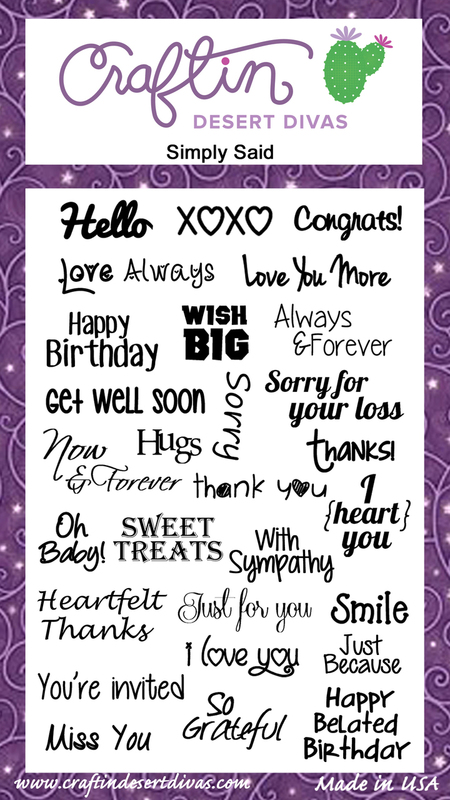 I must admit that I had a ton of fun making this card! I ended up getting inky and making a mess but sometimes that's the most fun! 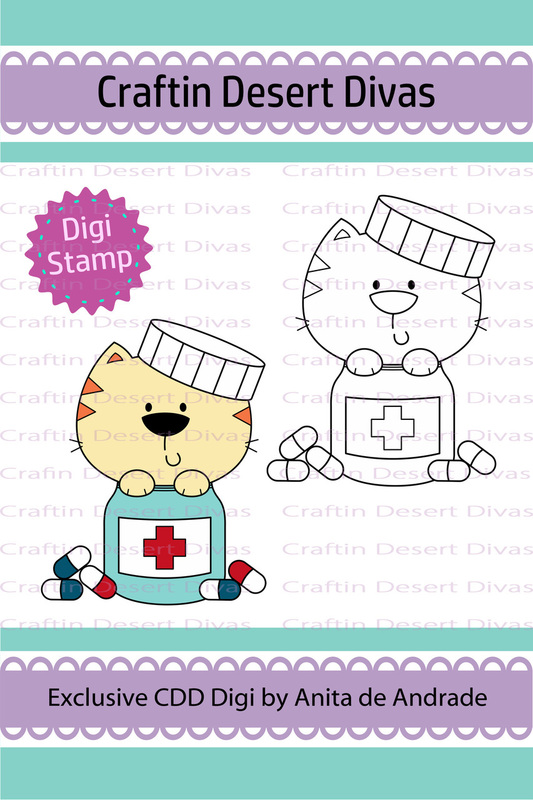 I have been finding myself in need of Get Well cards lately and Craftin Desert Divas has released several Get Well digital stamps recently. I had a hard time deciding which one to use!! I printed Get Well Cat onto Bristol paper. I find this is the best type of paper to used if I want to color my images with the Zig Clean Color Real Brush markers. They just seem to glide and blend together like butter!! I selected an assortment of Zig markers and went to town. I always seem to get the best blending when I use a dark, a light and blend the rest of the way out with my waterbrush. Sometimes I go back in and add a little more shadows and highlights but it doesn't take a lot of work. When I first got them I wasn't sure I really liked them. I have just kept practicing until I felt fairly comfortable with how they work. So don't get discouraged if you are just starting out! After it was all dry, I used my handy Scan & Cut 2 to cut out the image. I'm not sure how I ever lived without it! I couldn't decided on a background so I got out watercolor paper and distress inks that coordinated with the Zig markers I had used. I've been playing around with the Smooshing technique using a small piece of acetate to dab the watered down distress inks onto the paper. I tend to use my heat gun to mostly dry it between colors. Nobody wants icky brown mud! Unless you need a mud background! I dabbed and dried, dabbed and dried until I liked what I had. Since my background is already pretty busy, I didn't plan to use sequins but I wanted some sparkle! So I grabbed my mini spray bottle that has a mix of water and pearl ex. I sprayed the paper generously and let it dry. I don't think I caught the true amount of sparkle in my picture but I promise you it's gorgeous! 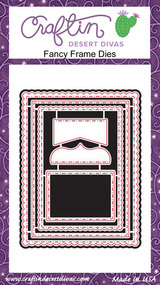 After that was all dry, I cut it out using the largest die from Fancy frames. Hand cut a charcoal layer to go behind it and used Wink of Stella on it to make it just as sparkly! Then I adhered it to the white card base. I used foam tape on the cat so she would stand out from the background. Then I was left with the sentiment dilemma. Does anyone else have this problem when using a large image?? 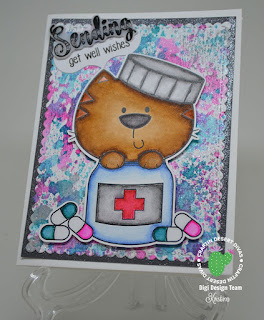 I found "Get Well Wishes" in the Simply Said set and it fit perfectly on one of the smaller dies in the Fancy Frames set. Then I stamped "Sending" from the same set onto thick vellum and heat embossed in black. I very carefully trimmed it out with scissors and mounted it with the clear Kooltak foam tape. Ta da! 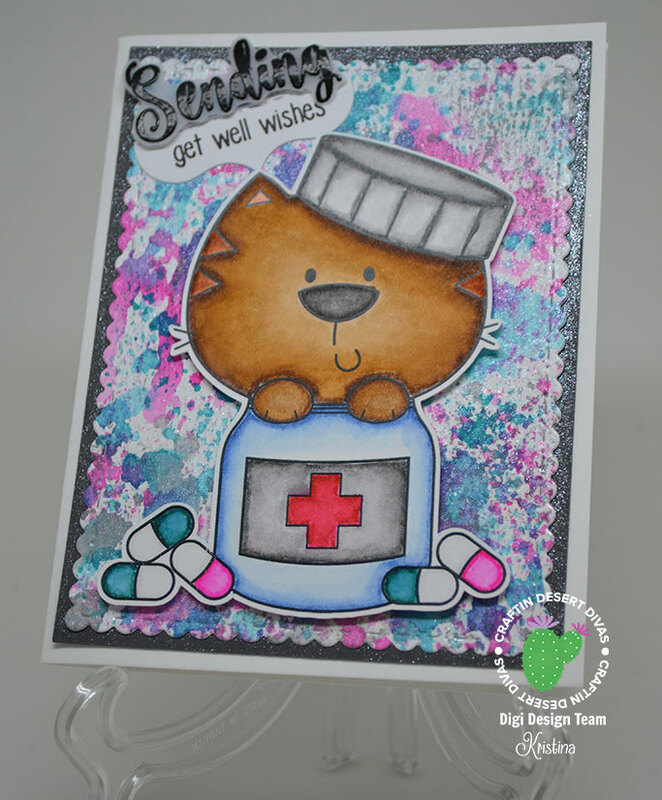 A happy Get Well Card I'm fairly certain would bring a smile to someones face!